Well good news for those who want to help a down on its luck company like Google update their maps. 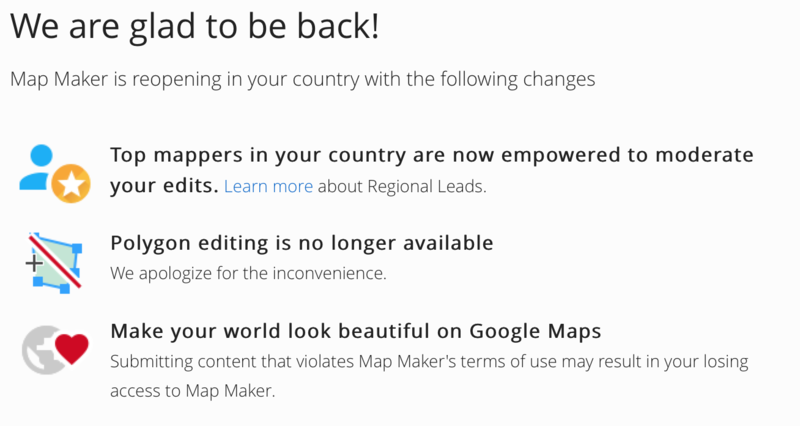 Google Map Maker, the tool which allows anyone around the world to contribute information to Google’s worldwide map, has re-opened in 45 countries after going live again in 6 countries two weeks ago. The product was temporarily shut down in May after it was discovered that some nefarious edits to the map, like geographic polygons shaped to depict an Android peeing on what is ostensibly an Apple logo, were being approved. If you want to help Google, just go to Google Map Maker and start editing. Just know your edits will get locked up and used to make a ton of money. Here in the USA you can’t create polygons yet but I suppose that will be back soon.